Pat Joyce is an award winning artist of classical realism. 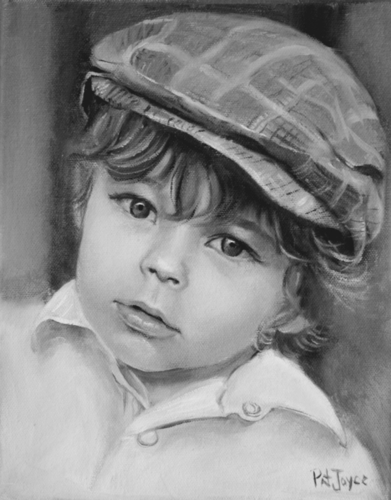 She has completed over 100 portrait commissions, throughout the US and Europe! She has been featured in the desk calendar 52Weeks/52Works since 2008; ACG Publishing, Cleveland. Her portrait drawing, "Jackie" won an award in the Portrait Society of America, Ohio Chapter Annual Competition. She has shown her work at the Atlanta Art's Center where she won Honorable Mention and she has been in several juried exhibits at Bayarts in Ohio. Pat would be happy to discuss working with you to create a portrait of you and/or your loved one(s). Ms. Joyce works from photographic images which she has taken, or, if that is not possible, from your photo. You are guaranteed a true legacy for you and your family.